Rob and Patsy are away for the weekend, so I decided to have a food preservation weekend. I know everyone has their own idea of fun. This is mine. This is the time of year when I want to fill jars and the freezers, and I get a lot of satisfaction from doing that. A week or so ago, Rob and I picked all the apples that were growing on the branches of the apple tree overhanging the garden. The apples were starting to fall, so we picked them, hoping they would be usable. Rob made me promise that if they were too bad/wormy, I would let them go into the compost heap. I started working with them last night. They were wormy, but not too bad. I carefully cut away the bad parts, and there was a lot of good apple left, so I made applesauce. So far, I have canned 7 quarts and there are more left to work on. 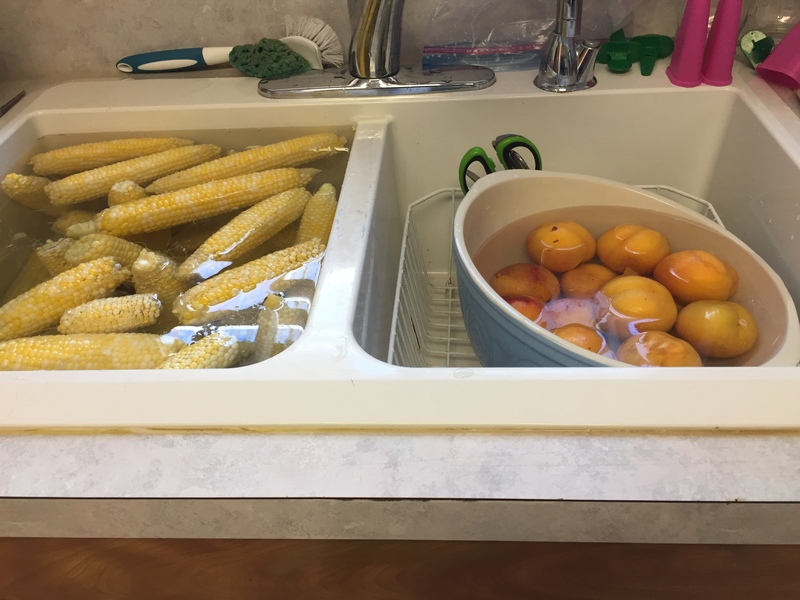 This morning, I started out going to my sister’s house and picking peaches, corn and tomatoes. Then I came home and picked what was ready in my garden, and got to work. Instead of having a day where I processed large quantities of one thing, today I did small batches of many things. I blanched and froze 2 pints of broccoli. These are side shoots on the same broccoli plants that I planted last spring. I have frozen very little this summer, so I”m glad to get these 2 packages. 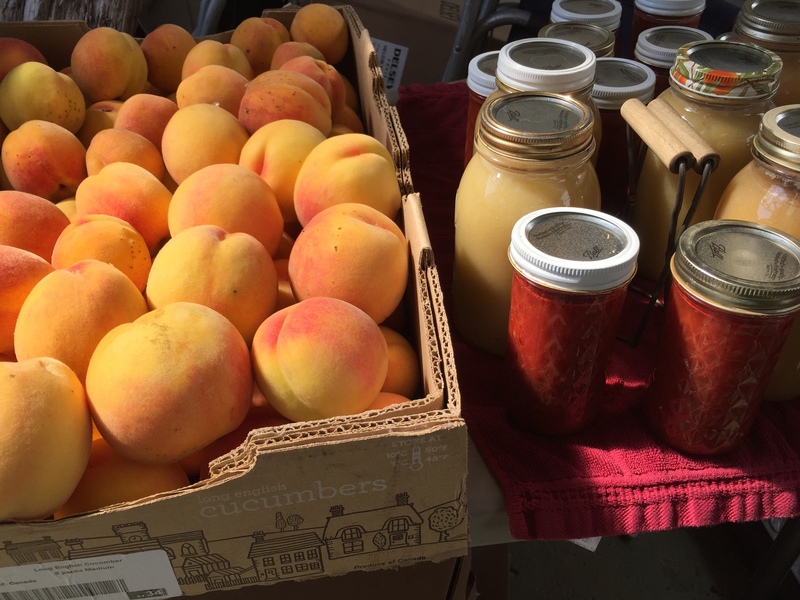 The peaches in this picture are Veterans, a soft, sweet, juice peach. I have 2 trays in the freezer right now, and a lot left to do over the next couple of days. They will need to be processed quickly, as they won’t keep well. 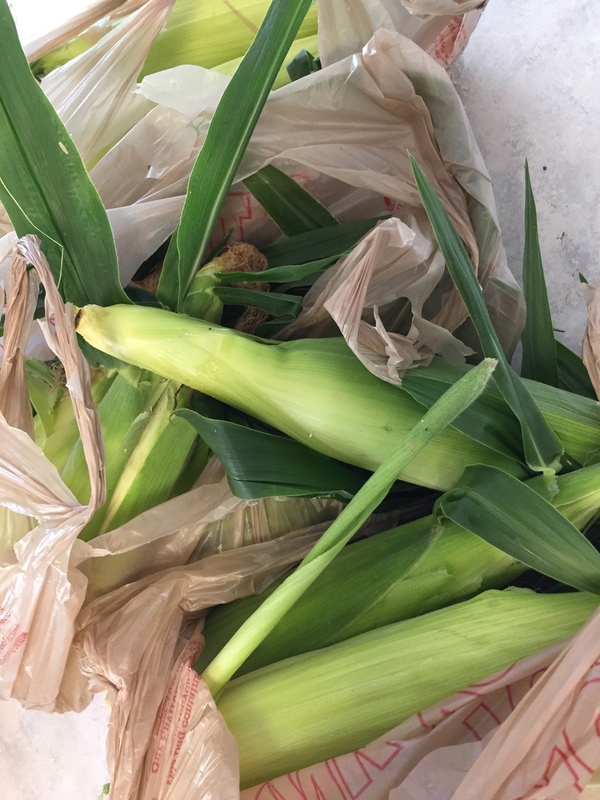 I brought home 3 bags of corn, and then picked the odds and ends from the first variety I grew in my garden. The big, beautiful cobs are from my sister’s garden. The little scrawny ones are what was left after we ate most of what was in my tiny patch, but there was enough to make them worth picking. 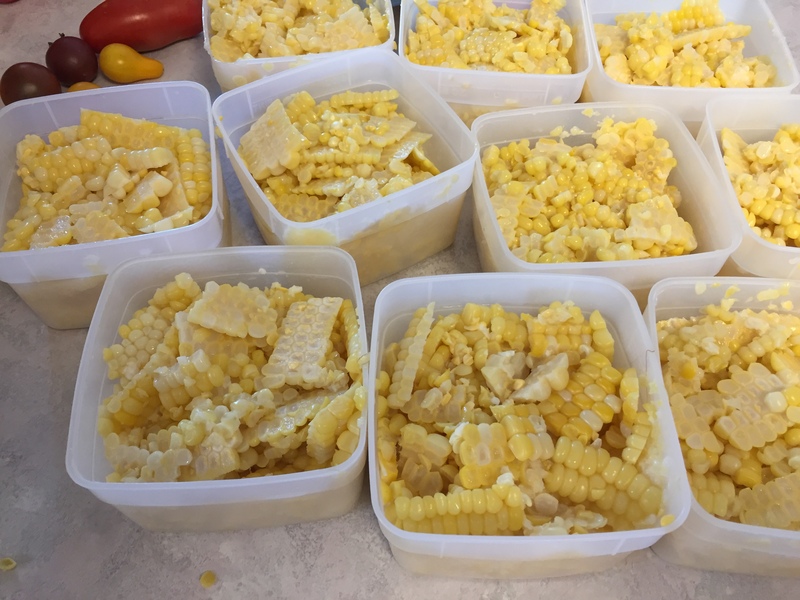 I blanched the cobs in batches and then cooled them in a super-clean sink of cold water. 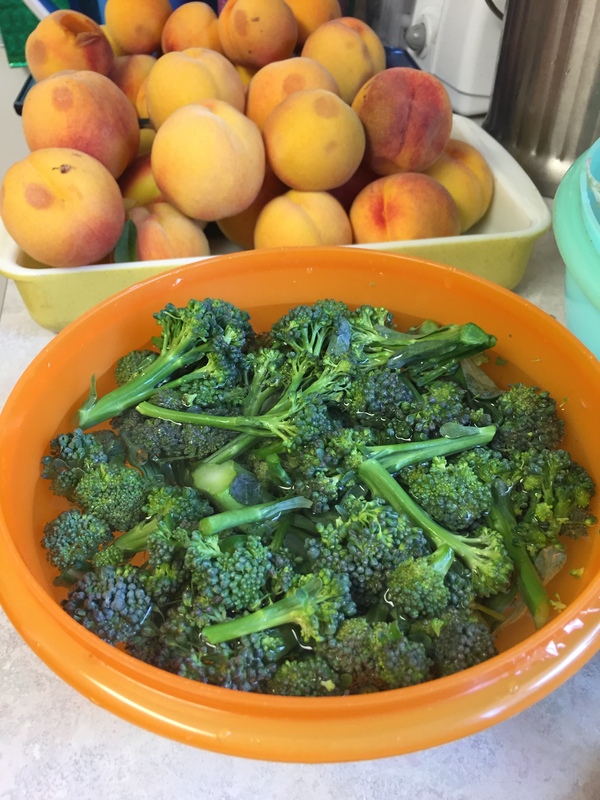 Then, I used the still-boiling blanching water to pour over the peaches I wanted to freeze so the skins would come off easily. I was very pleased to get 10 pint cartons for the freezer. 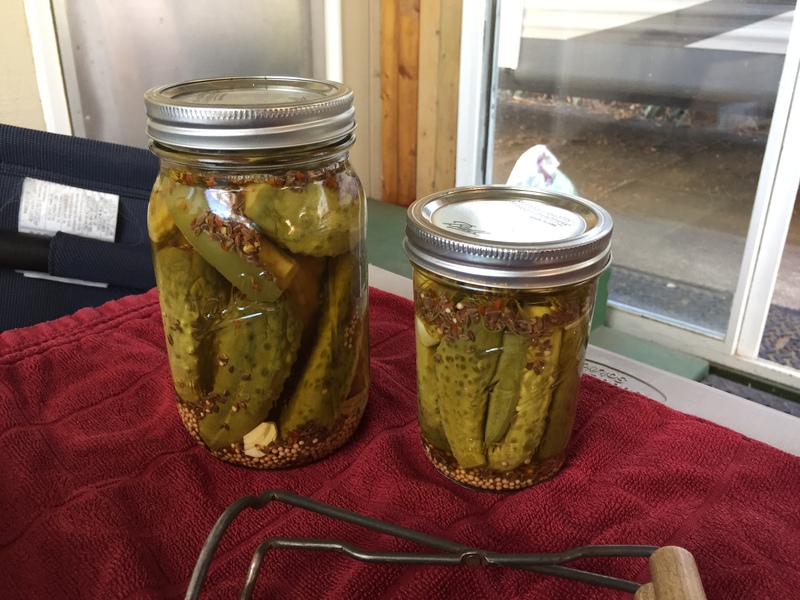 I finished the day by making jalapeño dill pickles, and got a pint and a quart, which I canned for the prescribed 15 minutes. It is so nice to have dill and peppers in the garden that I can grab quickly when I get a few ripe cucumbers. I am now collapsed in a heap on the couch, resting. I am pleased with my weekend’s production and am enthusiastic about doing more in the week ahead. I picked 2 good-sized boxes and a bucket of Improved Elberta peaches to can when they get ripe in a couple of days. I also picked a bucket of tomatoes to work on later in the week. The apples need to be finished and the cucumbers will have more ripe ones in a couple of days. I will finish up freezing the Veterans, as well. This will be a very busy week for me! I really love canning and preserving. I was so glad to see that the internet recipe for the enchilada sauce was safe….you just never know when you get it on-line, as I’m sure you know! I’ll bet you love teaching those classes. Maybe when I have more spare time, I can be more involved with the extension. Right now, we are still clinging to the 4H program in our previous county even though it’s a bit of a drive, because we know and love them all up there, and I didn’t want to change every single thing for the kids. However, the kids did not even do fair for the last few summers, due to our move and distance. So, I’m giving it one more year, because I really want this last child to have the opportunities all the other kids had. Then, we either need to change counties, or quit, or it will work out. We will see! I completely understand hanging on to your previous club. We are huge into 4-H, too. My daughter does poultry, rabbits, sheep, public speaking and next year she is adding a dairy heifer to her projects. We love our club and l get you not wanting to switch until you have to. I hope eventually you will be able to become a Master Food Preserver with your cooperative extension. You’d be a great teacher! My older children did so much more for 4H than the youngest does. Part of that is that I am getting tired and worn out:). Part is the distance. Part is that we are too far to maintain the same club members, so would have to look for new ones here, who would not want to travel so far for their county-wide experiences–they would want it closer to home, and I don’t blame them. Rob and I always ran the club, so we could start again, it’s just not super attractive to us right now with everything else going on. We will see how this year goes. I am really invested in the program, having been a leader for over 25 years. It’s such a good learning tool. That looks like a lot of work! The broccoli is beautiful- so green! I hope it’s okay to ask how things are on the job front. I don’t mean to be nosy but I’ve been reading your blog for a while and it’s so odd (but nice) how you come to care about people you only ‘know’ on the internet. Its such a one-sided thing, too, because I don’t have a blog or anything. But in any case, I have been thinking of you guys and wondering. Rob will continue working the same job as I am–caring for my autistic niece and special needs nephew, the same as he has all summer. Between the two of us, we can pull in what would be considered the salary for a 1-income family. It will be very tight, but after hours of pushing a pencil and figuring out numbers, we have figured out that we can make it, as long as there are no big disasters. Other people live on one salary. We can, too. My niece’s hours have increased because she needs more care since her school days are over, and we have worked out a schedule so that we will get the hours we need. A reason for this choice, besides the fact that more care hours are needing to be filled, is that Rob’s hip has become so painful that he is really struggling to get around. It’s clearly getting worse and worse. He is most likely going to need surgery before it’s fixed. Before the surgery, he needs to lose more weight. He also has to at least try therapy, but the first place he was going to said they could not help him, it was too bad. They are referring him to another place that has water therapy. Of course, the insurance with the previous job has ended. We now have different insurance, which meant we had to change primary care doctors and then he had to get all new referrals to get back to the same specialists that he had been seeing. So, we’ve had a delay in the process, but the wheel is starting to turn again. In a practical sense, I feel strongly that we need to address his hip issues before he goes on to get a more full-time job. I cannot work full time and home-school my niece, and keep the house up, etc. So, we feel very blessed that he can work part time, and so can I, with the kids–something he can totally do since it does not involve running, restraining kids, getting hit, kicked and spit on, and the other things that went along with his other job. I’m not sad he’s not going back there. At all. Because things are going to be on a tighter budget, we are slowly changing a few things and doing them in a more frugal way. Still, I am willing to do this, knowing that it is temporary. Once he gets fixed up, things will be a little easier financially, since he will work full-time. That’s the plan anyway! This will likely take a year or more, though, since there are many, many hoops to jump through to satisfy the conditions of the insurance company, and to do what the doctors want him to do. In the meantime, I am so pleased at having him home this summer, and am totally delighted that I will be seeing more of him when fall hits. We do so many things together when he is here–we often both take one of the kids we work with places, since it’s more fun with both of us there. He has been amazing at picking up the slack for me–he does any and all jobs that he can do such as folding laundry, watching the canner and pressure cooker while I fill more jars, driving people all around so I can do more physical tasks, taking our daughter to doctors and ortho and therapy and ……. (that’s one I hate doing and am so glad he’s doing so much of that now!). He can totally take Michaela(autistic niece) where she needs to go while I homeschool Alissa(niece I homeschool) once school starts, and drive Patsy (daughter) back and forth to her school. He just can’t walk very much at all and when he does, or does other physical things, he suffers for hours afterwards. The doctors want him to lay down all stretched out when it gets like that and it’s driving him nuts so he just doesn’t:). Then he pays. So, I am hopeful and confident that this is all going to work out, and we will get him fixed. My goodness, Becky, you have been busy! I know it will all be worth it when you are able to open a jar or a container, later, and enjoy what you’ve preserved. I was happy to read your response to the inquiry above, about your and Rob’s plans for the coming year, as far as employment and health care are concerned. Yes, it is possible to manage on a single income; I have every confidence that you’ll be able to do so. It sounds like you have a good plan! I always feel so much better if I have a plan. :). My husband had both his hips replaced at 50, because of arthritis. He is very active, and can do almost anything other than running. We are in fact planning on a rim to rim hike of the Grand Canyon in October – that’s how good his result was. Before, he couldn’t walk straight up anymore -he was slightly bent all the time. After the surgery, people were surprised at how tall he is. :). He slept in a recliner for a long time because sleeping in a bed was so hard. My own work is a bad situation right now. The company I work for was bought, and the company who bought it was only interested in a segment of the company, and not the segment I work in. I have stuck it out because I have a 30 hour/week salaried job with benefits, but it’s been yucky. I am interviewing for a job with Compassion International. I fly there this week. I would still be working at home, like I have done for years, but it would be full time versus part time. I have a lot of mixed emotions about that. I have two kids, and both are in college now, so working full time should be doable, but I’m afraid won’t leave much work/life balance. My husband works for a college, so he gets more time off than most, too, and I hate the thought that I will be working instead of being able to spend time with him. However, at least I would be working in a setting to do God’s will. So lots of thoughts and feelings, and I don’t even have an offer yet. Ha! I have worked part time since my 21 year old was 2. Your niece and nephew are so blessed to have people who love them who can also be their paid caretakers. It seems like a win/win. That’s encouraging–that your husband is doing so well. I’m longing for the day when mine is feeling better, and hip replacement is one thing they are talking about, after a lot of hoops have been jumped through. One day at a time! I hope your job situation works out well. It would be very hard for me to work 40 hours a week, so I understand those feelings. Compassion Int. might be a rewarding job, though…..lots to think about! You have done well this weekend! I guess I will skip the peaches this years because they are no better now than they were early in the season. Thank you for the update on the job situation and all. Now I know how to pray for your family. Thank you. All prayers are appreciated. I have been blessed with marvelous peaches this year. The ones I picked yesterday should have taken a couple of days to ripen, but I quickly realized that I needed to get on them this afternoon. I did the part that needed to be done, and will happily wait until tomorrow and the next day to do the rest. I didn’t want to lose them! You deserve a long nap. You did an amazing job and your family will eat well because of all your hard work. Oh, how I wish I could have taken one today! That was the plan. Until….I took a look at those peaches I picked only yesterday and needed to do part of them:). So, now, I’m resting, but don’t want to sleep so I have a chance of sleeping tonight.